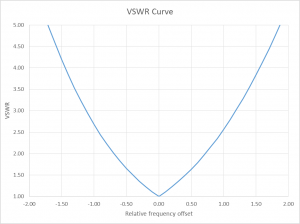 Above is that classic VSWR curve. Industry, universities, colleges and reputable textbooks carry a shared meaning of the term half power bandwidth. (Terman 1955) gives a consistent definition. Modern hams on the other hand are wont to talk the talk, but mean something different just to ensure that they are not really communication… it is after all evolving into a social hobby focussed on DX spotting. The half power bandwidth of a single series RLC circuit is the difference between upper and lower frequencies where the response is half that at the centre frequency. This occurs where the current (with constant voltage drive of course) is reduced to 0.707 that at the centre frequency, and therefore the power is half that at the centre frequency. Like an ordinary RLC circuit, the half power points of a series resonant antenna where R changes much more slowly than X occur approximately where X=±R. The VSWR wrt R0 where Z=R0±jR0 is 2.618, the ReturnLoss is 6.99dB. 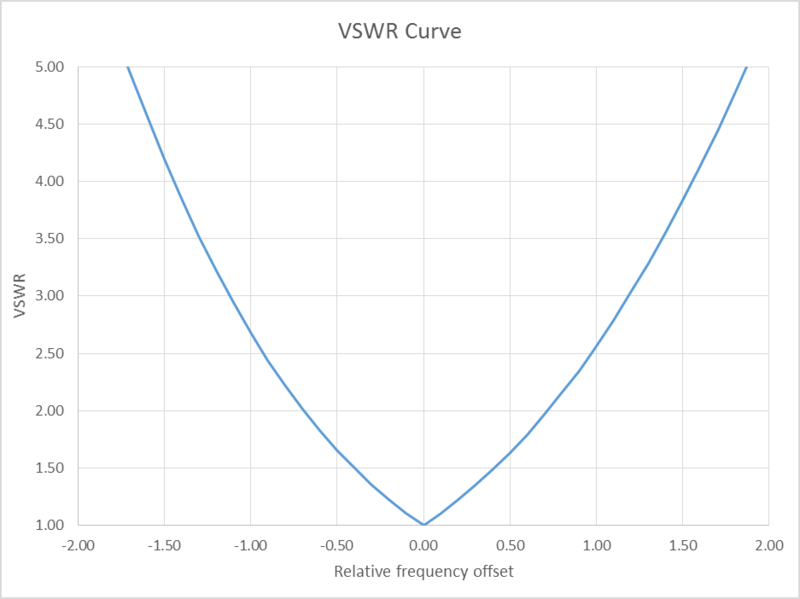 A VSWR curve for a simple series resonant circuit with constant R is easy to derive and antennas where R changes much more slowly than X exhibit a VSWR curve that is well approximated by this classic VSWR curve. We could rearrange that expression to find that given the VSWR=4.3 bandwidth stated by the online expert, that the half power bandwidth is in fact 63% of that VSWR=4.3 bandwidth. Much if not most of the ham discussion about STL is based on some pretty wooly thinking and dodgy formulas most of which are traceable back to one author, and it all prevails because of a lack of understanding of fundamentals and mindless regurgitation. Duffy, O, May 2014. Derivation of expression for X in terms of VSWR for a normalised load where R is constant and X changes with frequency. VSWRCurveDerivation.